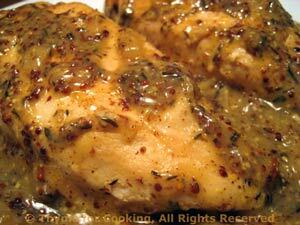 Dinner tonight: Chicken with Whole Grain Mustard Sauce. An easy 'two-dish' dinner for mid-week. Whole grain mustard and white wine, slightly reduced, make a lovely, light sauce for the chicken, bursting with flavor but low in calories. When onion starts to brown, move it to the sides of the pan and sauté chicken breasts until lightly browned. Add thyme, mustard and wine. Stir to combine. Remove chicken to a small platter, cover to keep warm. Increase heat under skillet and reduce sauce slightly. 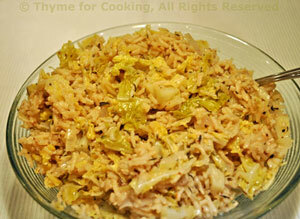 Rice and cabbage, cooked together in a skillet... An easy, nutritious side dish with very little 'hands-on' time. Heat oil in a large skillet over medium, heat. Add onion and sauté until starting to get tender, about 5 minutes. Add cabbage and stir-fry until it wilts. Add rice, mustard, thyme, chicken stock and wine. Stir well to combine, cover and simmer until rice is done, about 20 minutes longer. Stir occasionally.